Here are some suggestions, by myself and others. See the sidebar for my offerings, not forgetting “Polar Bears Have Big Feet” for the toddlers in your life, so they don’t feel left out when older kids get polar bear books to read over the summer: Facts & Myths for middle school ages, and Outstanding Survivors and/or EATEN (the polar bear attack thriller) for teens and adults. My most requested public lecture, Polar Bears: Outstanding Survivors of Climate Change, has been hugely popular with audiences in my Canadian home town of Victoria, British Columbia, and my newly-released book with the same title (based on that lecture) promises to be similarly successful. Here are some thoughts on both. Recently (5 January 5, 2017), I gave another free lecture about polar bears to a local non-profit organization through my university’s Speakers Bureau. I’ve been doing this since 2009, although the shear volume of requests has been much higher this past year than previously. As before, my lecture was warmly received and audience members asked questions indicating they had been listening with an open mind. A colleague I spoke to expressed surprise at that outcome, given where I live. The secret to the kind of reception I receive – even in my town – is to present the relevant facts without emotional overtones and let audiences make up their own minds about what they think of the situation. This latest lecture was not only well received but several audience members bought copies of my kid-friendly Polar Bear Facts and Myths that I had for sale (reviewed here by Kip Hansen). One member came up afterwards to say he’d been dreading what he’d anticipated would be another polar-bears-are-doomed diatribe but was very pleased at my even-handed, scientific approach. That’s why I decided to fashion my first fully referenced polar bear science book – and take it’s title – from my most successful public lecture. Audience responses over the years indicated to me that a simple summary would be an appealing approach. Questions from audience members over the years suggested which topics might need a more detailed explanation in the book. The lesson I learned from my lecturing experience was that my book needed a focused style, plenty of color images, and an affordable price. I expect I’ll get some negative fake reviews posted on Amazon for Polar Bears: Outstanding Survivors of Climate Change from the self-appointed moral-high-ground troll network (as they did for Polar Bear Facts and Myths). That’s to be expected for a topic like this. Honest criticism from readers might also be generated, of course, and that’s something all writers can expect, and should welcome. 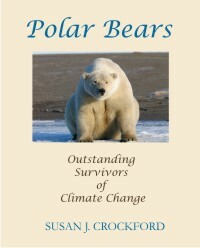 Both Polar Bears: Outstanding Survivors of Climate Change and Polar Bear Facts and Myths are now available in paperback and various ebook formats, including epub and pdf. The little spin-off for preschoolers (Polar Bears Have Big Feet) – because why shouldn’t the little kids have a fear-mongering-free polar bear book with great pictures too? – is available in paperback only. Without exception, every teacher of every school class I have spoken to in Victoria in the past year has been absolutely astonished to learn that the official global population estimate for polar bears is now 22,000-31,000, the highest estimate in 50 years. Virtually all expressed their appreciation for pointing out that simple fact. 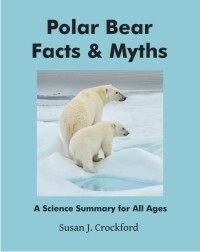 Hence, Polar Bear Facts and Myths is aimed at those misinformed children, while Polar Bears: Outstanding Survivors of Climate Change is aimed at their teachers, parents, and other influential relatives. It’s here! The book that explains, in just enough detail, why polar bears are thriving despite the gloomy prognostications of the data collectors and future survivor modelers. 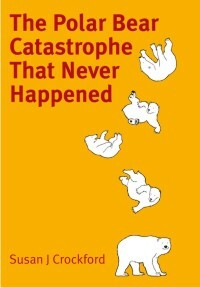 The first science book suitable for kids that tells the whole truth about polar bears and climate change is now for sale at Amazon. This beautiful, full color summary (44 pages, 8 x 10 inches) explains in simple terms why polar bears are thriving despite the recent loss of Arctic sea ice. It’s written in a question and answer format, in language that readers of all ages can understand (age 7 and up). The book takes a sensible, big-picture approach that many readers will appreciate and is based on the most up-to-date information available. This is the perfect gift for some of the polar bear lovers on your gift list and if you act quickly (order here), your book may arrive before the 25th. At this time, only the paperback is available but some ebook versions should be out shortly. For purchasers for which a pre-Christmas delivery isn’t going to work (publication will be later in Europe; shipping is faster to eastern Canada and the US than to the west), I have provided a gift card you can download to print off and give in lieu of the physical book (kind of a placeholder until it arrives). Download gift card PDF HERE for Polar Bears: Outstanding Survivors of Climate Change (coming soon, see below). Check my book website for updates. This color, fully-referenced polar bear science book is aimed at adults and high school students. Polar Bears: Outstanding Survivors of Climate Change is fashioned after the popular lecture with the same title I have given since 2009, which has been enthusiastically received by audiences with diverse backgrounds. My book website now has full details of these new non-fiction books (along with a revised author biography) and will be updated regularly regarding formats and venues as they become available. Details for EATEN on that site has moved to its own fiction page.